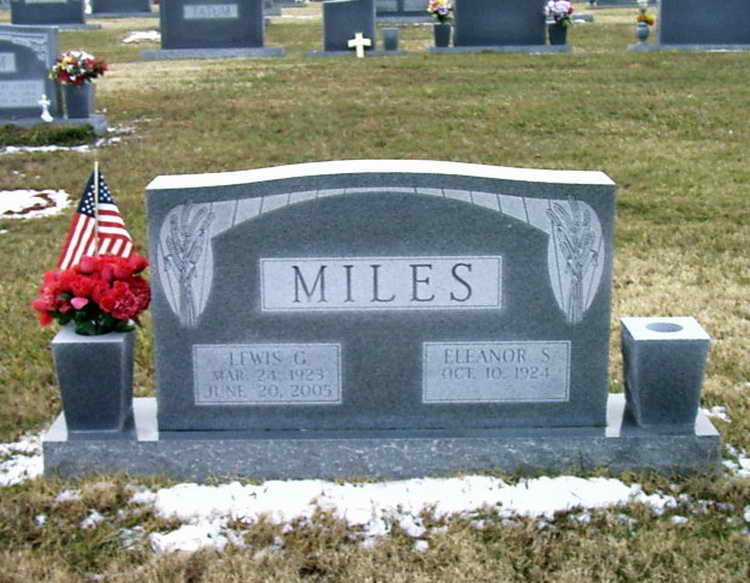 Grave marker for Lewis G. Miles in the Mountain View Cemetery, Ridgeway (Henry county), Virginia. Henry enlisted at Roanoke, VA on 7 January 1943. After completion of jump school he was sent overseas to England. Pvt Lewis was transferred from the 82nd Division Replacement Depot in Leicester England to Service Company, 508th PIR on 5 October 44 and was subsequently transferred to Company B six weeks later. Lewis Gale Miles, 82, of 6260 Greensboro Road, Ridgeway, died Monday, June 20, 2005, at Memorial Hospital in Martinsville. He was born in Franklin County on March 24, 1923, to Shannon Via Miles and Lizzie Lee Miles. In addition to his parents, he was preceded in death by two sisters, Margaret M. Crawford and Alice M. Wood; and a brother, Herbert Miles. He served with the Army 82nd Airborne Division during World War II, retired from DuPont as a mechanic with 31 years of service, and he attended the First Baptist Church of Ridgeway. Surviving are his wife, Eleanor Sowder Miles of the home; a daughter, Rita M. Loving of Roanoke; a stepdaughter, Wilma S. Wimbish of Gainesville, Ga.; one son, Shannon Gale Miles of South Boston; a sister, Mildred M. Mountcastle of Roanoke; nine grandchildren; and 12 great-grandchildren. The funeral will be held at 11 a.m. Wednesday at Norris Funeral Services chapel with the Rev. Gary Edwards officiating. Friends will be received at the funeral home from 6-8 p.m. today.